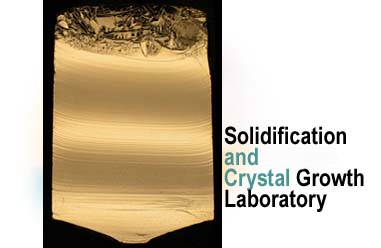 Welcome to the home page of Solidification and Crystal Growth Research Group in the Mechanical Engineering Department at Bogazici University. Research interest of this group is investigation of materials behavior during solidification, analysis of solute redistribution during solidification, effects of the processing variables like heat gradient, convection, and diffusion on the solid-liquid interface stability. Moreover, the main interest of the group is Single Crystal Growth of semiconductors, superalloys, intermetallics, oxides, diamond, etc. Ongoing project of the group is Single Crystal Growth of Germanium-Silicon (Ge-Si) by Axial Heat Processing Technique (AHP). Visitors can find more information through Projects button on the link bar. Ge-Si (AHP) single crystal growth of Germanium-Silicon by Axial Heat Processing Technique (AHP)!